Twice every summer, The ASC Theatre Camp (ASCTC) plunges 39 high-school students into three weeks of intensive, immersive, incomparable programming in the Shakespearean Shangri-La of Staunton, Virginia – home of the American Shakespeare Center and the world’s only recreation of the Blackfriars Playhouse, Shakespeare’s indoor theatre. At ASCTC, we transport students out of their normal lives and beyond their comfort zone. We challenge them to explore the limits of their infinite potential in a safe, stable, supportive environment, and they emerge not only with finer control over their craft and better preparation for college, but also with more confidence, more capability, and more capacity for growth and change. ASCTC participants preview the college experience by living and working on the residential campus at Mary Baldwin University. They live in dorms, work in university classrooms and performance spaces, and eat in the dining hall. 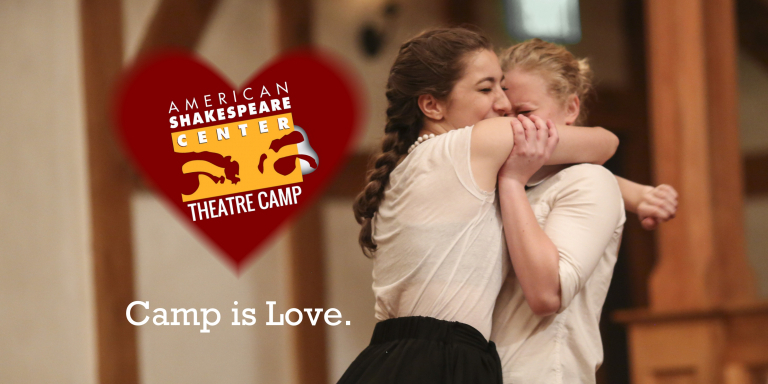 They spend their days rehearsing with professional directors, training with professional actors, and learning from professional academics: ASC actors, MBU graduate-level faculty, preeminent scholars, and (of course) each other. They spend their evenings at the Blackfriars Playhouse, spellbound by Shakespeare’s stagecraft. Students can enroll in the college credit companion course and earn three college credits from Mary Baldwin University, transferable to other institutions. They can elect to stay for an extended week of internship experience, getting hands-on practice working with a professional theatre company. But all work and no play makes camp a dull sport – even when working feels like playing. Mornings off bring sleeping in and brunching at the local Farmer’s market. Days off bring trips to the lake, water balloon fights, dance parties, and well-earned opportunities to luxuriate in languorous laziness. Three weeks of this chimeric, collaborative creativity culminates in the Final Performance Festival, where campers mount their final productions (for a packed house) on the Blackfriars Playhouse stage. Without question I think this was a phenomenal opportunity. These campers will have had the knowledge and experience of having already gone through a similar experience so that when they do it for real, it won’t be so intimidating. They know that they can live away from mom and dad and that they will make friends and be able to study things that interest them. Camp is Love. Help us spread it. Make a tax-deductible donation to the ASCTC Scholarship Fund.